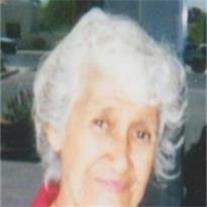 Anita Madrigal Chabarria, 78, passed away April 27, 2011 in Mesa, Arizona. She was born August 28, 1932 in Georgetown, Texas to Samuel and Elena Madrigal Perez. She was a loving wife and mother who found joy in caring for her family. She was preceded in death by her husband Gilbert Chabarria, son Gilbert Chabarria, Jr. and daughter Sarah Chabarria. She is survived by her sons Samuel M Chabarria, Vito Chabarria, Juan Chabarria, Daniel Chabarria and loved by many family members who will miss her. Visitation is Monday, May 2, 2011 at from 10 AM to noon at Bunker’s Garden Chapel, 33 N. Centennial Way in Mesa. Interment will follow at 1 PM at the National Memorial Cemetery of Arizona in Phoenix.